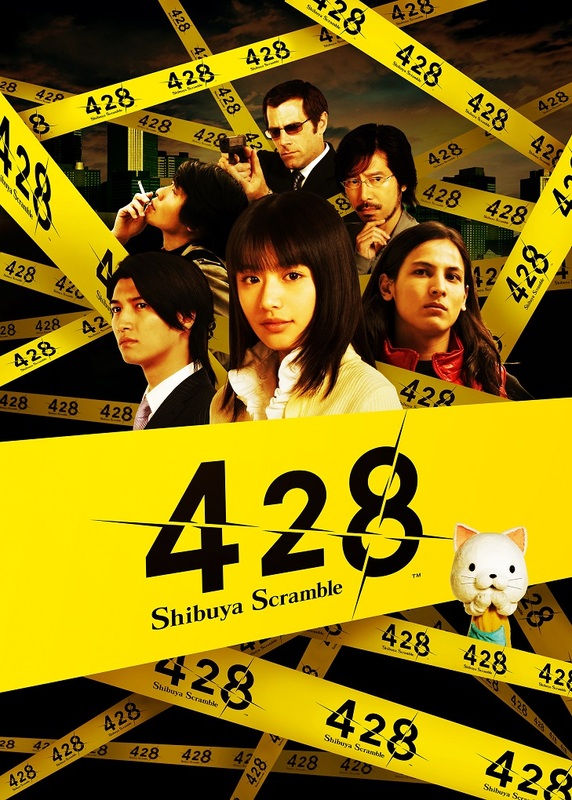 428: Shibuya Scramble stars five protagonists who get involved in what looks like, at first, a random kidnapping case in Shibuya. As the game progresses over a ten-hour (in-game) period, the five characters begin to interact with each other and influence each other’s own storyline in various ways that will result in more than fifty available endings as the game heads towards its conclusion. During GDC 2018, I was able to interview David Kracker, the localization director for 428: Shibuya Scramble. During our time together, we talked about how how a game steeped heavily in local Japanese culture can be brought over to foreign shores, what new content is available in this edition, and what he hopes that people get from this game. You can check out Spike Chunsoft’s website, follow them on Instagram, view them on Twitch, subscribe to them on YouTube, tweet them at Twitter, and like them on Facebook. You can also check out my impressions of what I got to see of 428: Shibuya Scramble here. Operation Rainfall: I’m Quentin H. with Operation Rainfall, and you are? David Kracker: My name is David Kracker, and I am the localization director for 428 Shibuya Scramble. OR: What is 428: Shibuya Scramble? 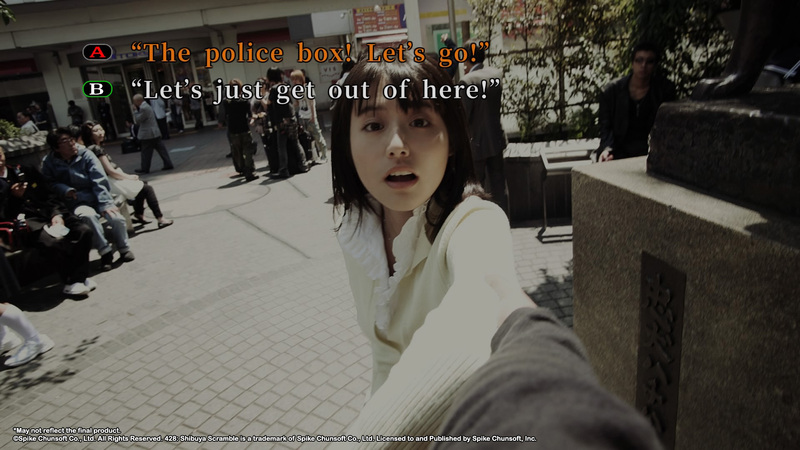 DK: 428: Shibuya Scramble is a visual novel set in modern-day Japan. It’s all live-action footage, so it’s real actors on the real streets of Tokyo. The setting is Shibuya, which is the youth center of Tokyo. Shibuya Station is one of the busiest train stations in the entire world. The name comes from the ‘Shibuya Scramble Crosswalk’, which is located outside of Shibuya Station. The closest thing I can compare it to is the ‘Times Square of Japan’. If you ever see a modern movie set in Japan, you’ll probably have an establishing shot of the ‘Shibuya Scramble’ with loads of people crashing into each other from different directions like in Lost in Translation or one of the Resident Evil movies as a fight in the ‘Shibuya Scramble’. The name itself is a pun. Because there is the ‘Shibuya Scramble’ intersection, but it is also a story of these five different people scrambling through the streets of Shibuya [and] trying to set things right. 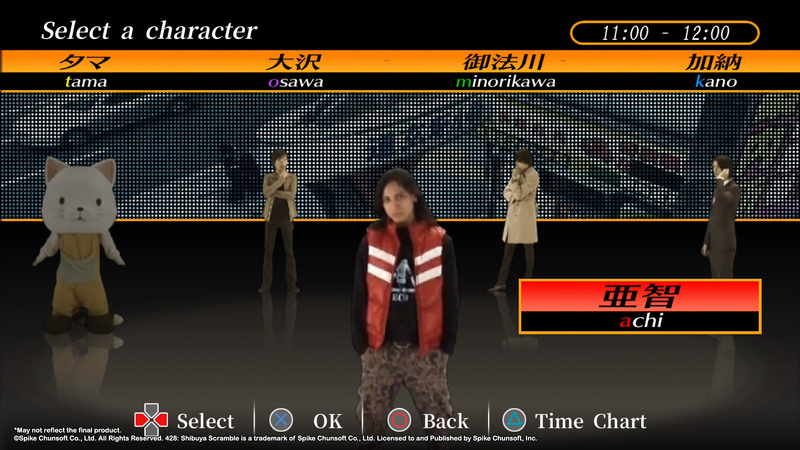 The five main characters that the story of 428: Shibuya Scramble focuses around. (Image courtesy of Spike Chunsoft). OR: This game originally came out for the Wii and the PlayStation consoles in 2008 and 2009. Why, after all this time, is this game being localized worldwide? So looking through our back catalog, it’s like ‘Which of these games do we bring out as a test case?’ And [428: Shibuya Scramble] was kind of the pinnacle of visual novels in Japan. It received a perfect forty out of forty in Famitsu magazine. So we figured [that] if we’re going to do a test run, we should put our best foot forward. OR: This game makes heavy reference to Japanese culture and Japanese lifestyle. In fact, one of the main characters is a cat mascot. How do you localize these elements in [428: Shibuya Scramble] to make them accessible to players worldwide without fundamentally changing the game in the process? DK: There is an idea in localization where it’s like when you’re reading the original Japanese, you want to try to find the English script that’s within it. And the way that 428 [Shibuya Scramble] is written, it’s like a very – the themes and writing style are, I think, very universal. 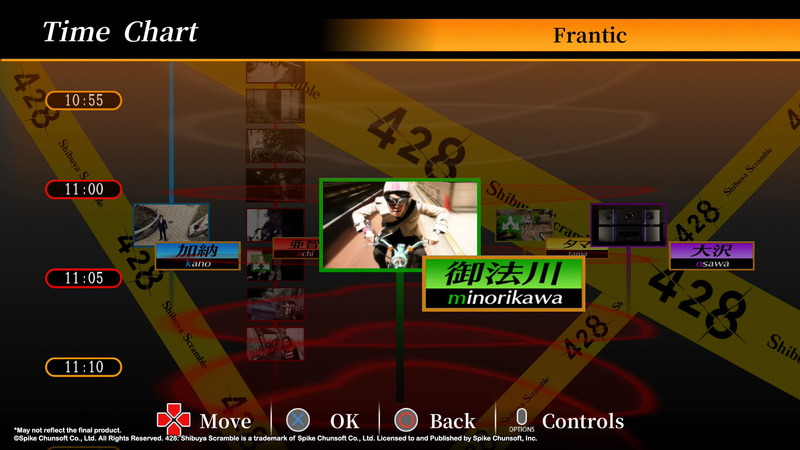 Even though the setting is Japan, so the player might not be immediately familiar with the surroundings, the style of [428: Shibuya Scramble] has the advantage of – you literally have visual cues. 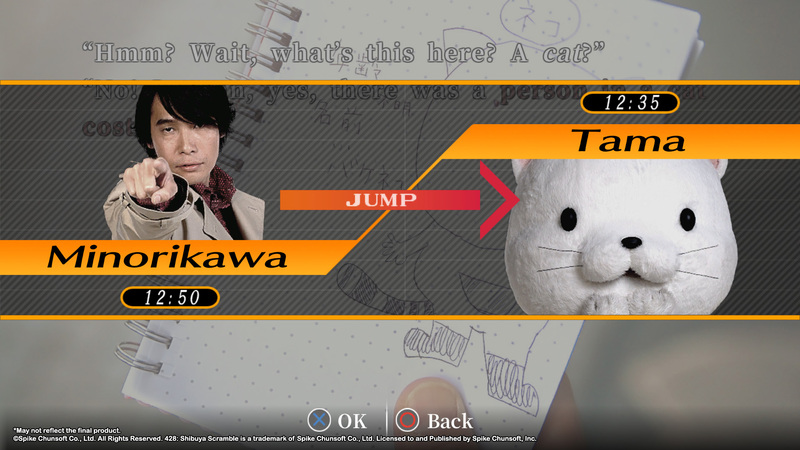 And so [428: Shibuya Scramble] actually has a lot of built-in failsafes where even if you don’t understand anything about Japan and Japanese culture, you’ll have enough visual cues and also just straight-up explanations within the game’s ‘Tip System’ that anybody can follow along. OR: In other words, you’re not calling ‘rice balls’ ‘hamburgers’ in this game. OR: There are multiple different endings in [428: Shibuya Scramble]. How many different endings are there? DK: There are over fifty different endings, I’ll say that much. The multiple different endings are – the majority of them are bad endings. So on the surface you might think ‘I want to try to avoid bad endings.’ But the bad endings can give you an insight into the plot. Think of it like the B-side of the story. Where you might not see this character’s motivations in the main plot, but in the bad ending, you can kind of see a side of them that you wouldn’t necessarily see. And some of the bad endings are also just really out there. I’m not sure if you can call them ‘non-canon’, because they occur within the game, so I guess [that] they are canonical in that sense. But they’re kind of too ridiculous to be true. So it’s actually more fun to make bad decisions on purpose and search out these bad endings. And also, once you clear the main scenario, there’s a number of side scenarios and hidden features that you can only access if you’ve collected a certain number of bad endings. The game also has a system where it’s a list of the bad endings you’ve achieved. You can kind of guesstimate that ‘Okay, I have all of this character’s bad endings for the eleven o’clock time block, but there’s a gap here – so obviously I need to go back here [to get more].’ It also provides a puzzle-like element, because you know something terrible happens to this character in this time slot, but [you have to figure out] what choices to make to make that bad thing happen. The stories can take a wrong turn at any moment and result in a bad ending…and for once, you’ll want to get them all as you play through 428: Shibuya Scramble. (Images courtesy of Spike Chunsoft). OR: You mentioned additional modes. Can you talk anymore about that? DK: Its not like a spoiler, because it won’t spoil the story – but I wouldn’t want to spoil the surprise. I will say that the game is very out there in a lot of ways. Either like fourth-wall breaking, or just like ‘Why would you go out of your way to improve those features?’ Because, I mean, it’s a thing that you want – it’s very much like fan service, because most people would be simply satisfied with clearing the main scenario and ending the game there. So if the player wants to go the extra mile to unearth these easter eggs, I think that they will be well rewarded, because it gives you – for example, one of the unlocks you can get are side stories for the various sub-characters in the game. And these characters may not get a lot of screen time, but these side stories can – they are usually very comical with some sort of twist ending. They are self-contained stories within the world of 428 [Shibuya Scramble] that will that kind of stick with you even when you finish the game. OR: With over fifty different endings and branching story lines, is everything making it over intact from the Japanese version to the English release [of 428: Shibuya Scramble]? DK: Yeah, all the content is there. Same story, we really didn’t edit or change anything. On the localization end, like I said, the themes and the story are very universal. So I think the English script comes from us straight and clear. I believe that you’ll definitely be able to find a character whose conflict reflects the kinds of things that you’re going through in your own life. So you can kind of latch onto one particular character and kind of carry you through the story. The one thing that we did change is the various jokes and puns. Like I said, the humor in the game is very subtle, but high-brow/low-brow. There’s a lot of ‘dad’ jokes and stupid humor that is done in a very smart way. 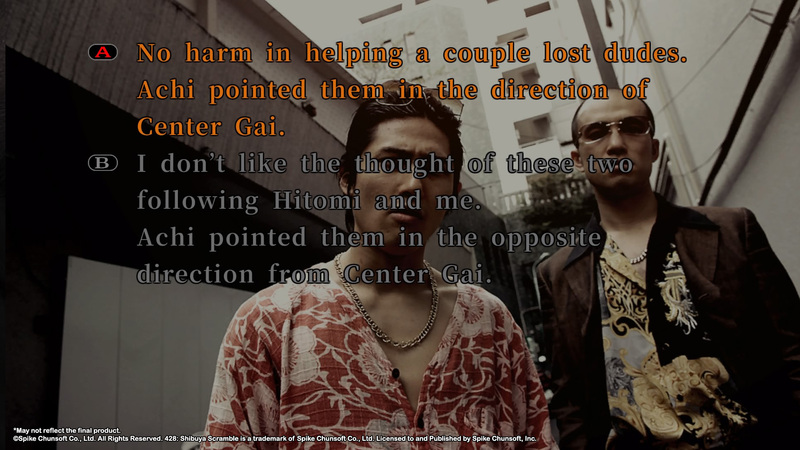 So that’s the one thing that I wanted [the localizers] to spend a lot of time on. I think they’ve pulled through. Being the localization director, I have to read all of the scripts as they come in [and] I have to catch myself laughing out loud at my desk – even though I already know what the joke is. It’s still always catches me by surprise while reading it. As you play though each time block in 428: Shibuya Scramble, you will sometimes switch character perspectives without any warning. (Images courtesy of Spike Chunsoft). OR: Will trophies be implemented in [428: Shibuya Scramble]? DK: Yes. Everything from the PlayStation 3 version will be brought over. OR: Last question – to someone who may be thinking about picking up [428: Shibuya Scramble], what do you have to say to them? DK: Like I said, it’s somewhere between a visual novel and a live-action TV series. I think a lot of people that would be interested in visual novels might be kind of turned off because ‘Oh, I don’t like anime aesthetics’ or ‘Why don’t I just read a book instead?’ But because of the presentation of [428: Shibuya Scramble] is very unique and the different visual effects and sound design give it a very cinematic feel, so it’s not the kind of experience that you can get from playing normal visual novels. It’s not the experience you can get from watching a TV show. You get to take the story at your own pace and internalize things – and like I said, you’ll probably find a character that you connect with. Are you a fan of visual novels? How are excited are you to see 428: Shibuya Scramble coming to North America?